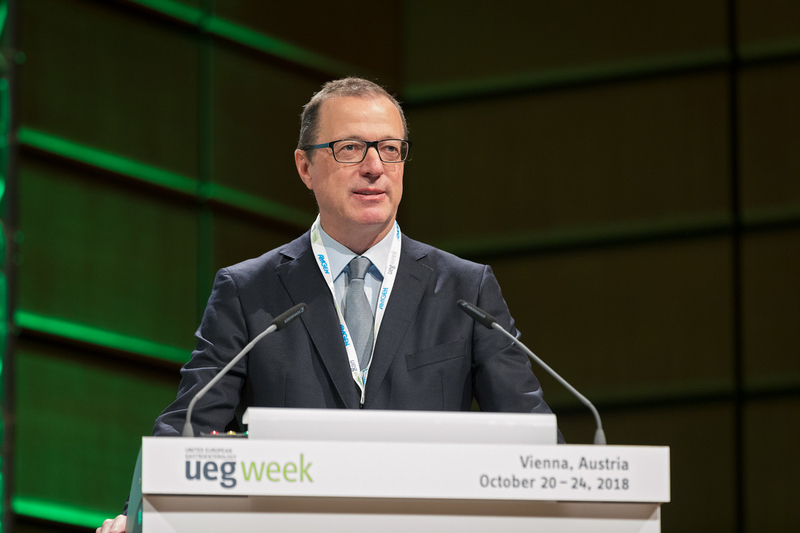 Tuesday at UEG Week Vienna 2018 marked the second day of the Scientific Programme. The day provided an exciting mix of interactive learning sessions with live endoscopies, a look into EU funding opportunities in digestive health, as well as discussions on obesity and nutrition. Delegates also heard updates on future therapies and precision medicine in IBD, the current state of colorectal cancer screening across the European continent and new clinical guidelines in the treatment of liver cancer. Follow @my_UEG to join in the conversation on Twitter. 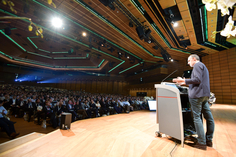 Scientific Programme Highlights: Microbiota: Friends or Foes? In this session, the role of microbiota in the human gut was discussed and whether they are our friends or our foes. Harry Sokol began the session with a presentation on fungi microbiota and its role in gut physiology. In a recent study on mice, Sokol found that fungi can replace the protective effect of bacterial microbiota in response to the influenza virus. Following Sokol, Patrice Cani discussed the potential role of gut microbiota derived compounds acting as trigger factors in metabolic diseases. In an exploratory study, Cani loked at the role of Akkermansia in humans and how this could effect cholesterol, insulin sensitivity and liver enzymes. Fergus Shanahan concluded the session exploring how to select the right microbiota for interventions. When matching an intervention with a disorder, many different options were presented, from faecal microbiotic transplants, microbial consortia, single strain or even Phages. Shanahan concluded his talk and the session by presenting a study where microbiome changes have been linked to colon cancer and intermediate changes with polyps. He explained the need to be careful with microbiome interventions, such as in faecal microbiota transplantations in cases where the benefits aren't fully proven. Catch up on the session's action on Twitter. In these unique live sessions, UEG brings top international experts to the auditorium live from the operating room. The experts demonstrate cutting edge techniques as well as basic procedures for an interactive learning experience. In the second live endoscopy session of the day, we followed several procedures, including a Cholangioscopy, Endoscopic Sleeve Gastroplasty, Gastric ESD and an EUS-guided RFA. Each case was presented with the patient’s medical history and current problem before the scheduled procedure took place live on the screen in front of the audience. 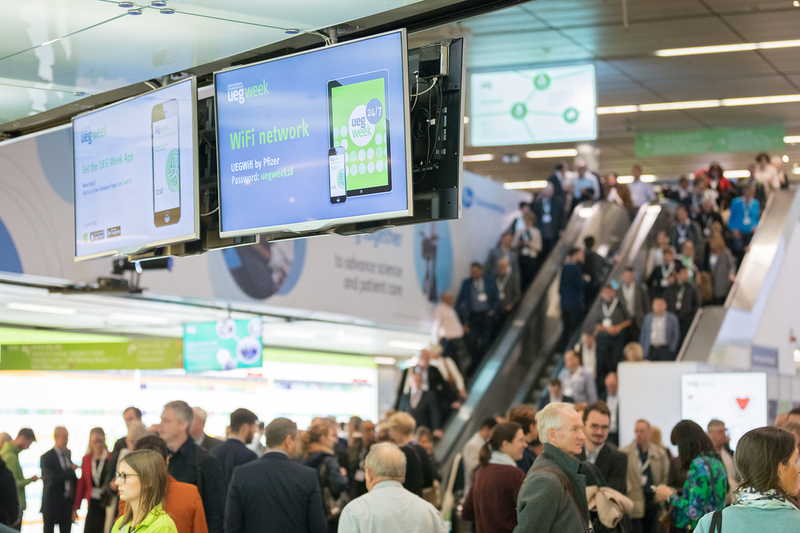 Throughout the procedures, the audience - both those sat in the auditorium and those following the live stream online - could ask the physicians any questions they had regarding the procedures by using the UEG Week App. The first procedure was an ERCP + Cholangioscopy + EHL where the learning objectives were to gain insights into cholangioscopy and lithotripsy. Pierre Deprez and Andrea Tringali, who led the procedure, used new technology and demonstrated the removal of a bilary stone. In the next procedure, an Endoscopic Sleeve Gastroplasy, the audience witnessed the use of the Apollo Overstich and the overstich technology. Following this, Alessandro Repici led the third procedure which was a Gastric ESD with the learning objectives of providing indications to gastric ESD and potential ESD complications. This was one of three live endoscopy sessions featured in the UEG Week 2018 Scientific Programme. In this session the different EU funding opportunities in digestive health were discussed. Chair of the UEG Research Board, Arthur Kaser led the session and began by discussing UEG and its facilitating role in pan-European digestive health research. He mentioned the many different ways UEG support research, for example through their Research Prize, Rising Star Award and UEG Research Fellowship - a new addition to UEG Research. 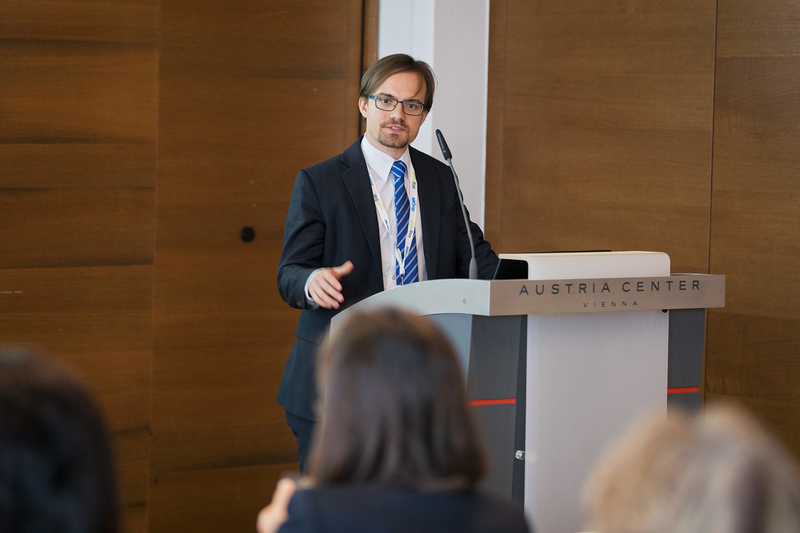 The UEG Research Fellowship offers the chance for young researchers to take the next step in their scientific career by carrying out an extensive research project that they would be unable to do at their home institution, enabling them to build their network and learn new research skills. In 2019 UEG will be awarding €50,000 to a researcher to spend 12 months working with a renowned European principal investigator. Application is open until January 18, 2019. Guy E. Boeckxstaens introduced the ERC Advanced Grant, a highly competitive grant open to active researchers with a track-record of significant research achievements in the last 10 years. Applicants are encouraged to put forward ground-breaking projects that are outside of the box and include state-of-the-art techniques. Marie Sklodowska-Curie Actions (MSCA) provides grants for all career levels and is open to all domains of research and innovation. This fellowship supports researchers at all stages of their careers, regardless of age and nationality and also supports cooperation between industry and academia to enhance employability and career development. A key part of the UEG Week Scientific Programme is the extreme variety of information and learning experiences it provides. This afternoon's session on obesity and nutrition was another abstract based session, allowing researchers to present their latest findings from their work. Anne Christin Meyer-Gerspach began with her study entitled 'GLP-1 Affects Central Regulation of Appetite in Healthy Lean Males' which found that GLP-1 affects central regulation of appetite by modulating rsFC in both homeostatic and reward-related brain regions. Ludovica Guerriero continued the session with a discussion on Endoscopic Sleeve Gastroplasty (ESG) and her study 'Endoscopic Sleeve Gastroplasty: A Metabolic Procedure? found that ESG is an effective bariatric endoscopic procedure which resulted in a positive impact on metabolic diseases, especially diabetes, as well as quality of life. It also showed that it provides a unique opportunity to reach a greater number of obese patients earlier in their disease, such as non surgical candidates or patients unwilling to undergo surgery. Haim Shirin presented his study 'Safety, Tolerability and Efficacy of a Novel Self-use Biodegradable Device for Obesity'. The technology behind the device was based on absorbent pharmaceuticals polymers and bonding materials that self-expand in the stomach to create a pH sensitive super absorbent scaffold. His findings showed that the device was tolerated and safe and that the 12 weeks of treatment resulted in weight loss and cardiometabolic improvements. Concluding the session was Masato Mukami, who presented his study exploring the use of Transesophageal Gastrotubing (PTEG) as a suitable procedure for patients where Percutaneous Endoscopic Gastronomy (PEG) is contraindicated. His results found this successful in all 179 patients and concluded that PTEG is safe and useful for long-term nutrition and/or decompression for the patient who is contraindicated to PEG. PTEG is a suitable procedure for patients with an eating disorder and/or the malignant disease as tubal feeding and palliative care. Catch up on this session's action on Twitter. 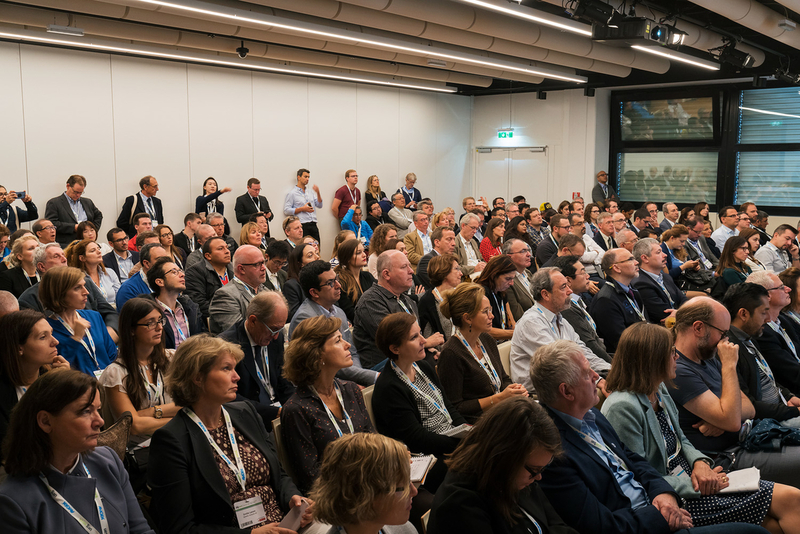 UEG Week continues to deliver cutting-edge science and new research within its Scientific Programme, and one of this year’s highlights is a study investigating the presence of microplastics in human stools. The research assessed participants from eight countries across the world, including Finland, Italy, Japan, the Netherlands, Poland, Russia, the UK and Austria. Every single stool sample tested positive for the presence of microplastic. As lead researcher, Dr. Philipp Schwabl, commented “This is the first study of its kind and confirms what we have long suspected, that plastics ultimately reach the human gut”. UEG is looking forward to seeing further research evolve from this pilot study and into how microplastics affect the human digestive system. After a supporting press release on the topic, global coverage was achieved, including articles in National Geographic, Der Standard, The New York Times and The Guardian. Another highlight of this year’s Scientific Programme has been a study revealing that, surprisingly, colorectal cancer rates in young adults has been increasing by 6% every year between 2008 and 2016. This research, that included data from 20 European national cancer registries, analysed incidence rate trends among young adults with CRC across Europe in the last 25 years, with findings being presented at this year's UEG Week. Although traditionally considered a disease that affects people over the age of 50, young-onset CRC is often more aggressive and more likely to be diagnosed at an advanced stage, which makes these new findings especially worrying. Author Dr Fanny Vuik comments, “The cause for this upward trend is still unknown, although may be related to increasingly sedentary lifestyles, obesity and poor diets”. Dr Vuik adds to her research by saying that "identifying those young adults at high risk of CRC is essential to ensuring early diagnosis and optimal patient outcomes"
Catch up on Monday's action! 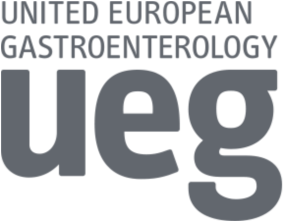 Catch up on the Postgraduate Teaching Programme!